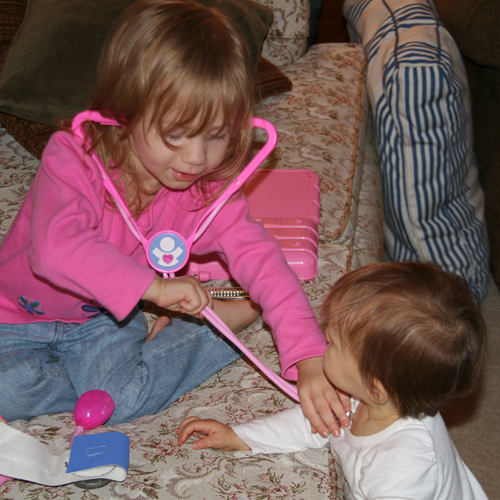 I was lucky to watch Emily play Doctor with Julia as they played together. It was mesmerizing and I was lucky to get any photos of it because I didn’t want to disturb their play. 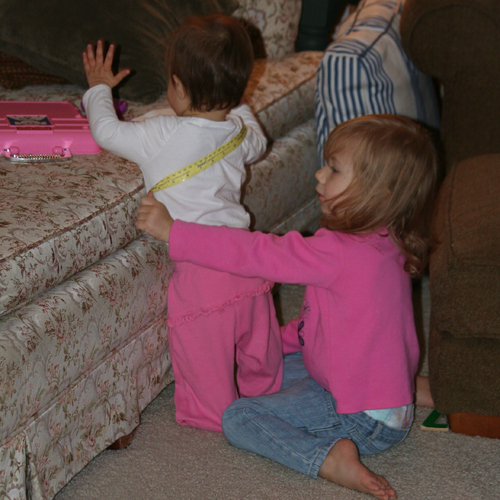 As I watched them play, Emily measured Julia’s head size, took her temperature under her arm, gave her a shot on her arm, looked in her ear, and then listened to her heart. When she held the stethoscope to her chest she said ‘thump, thump’. For the most part Julia stood and allowed Emily to perform the various doctor tasks. At one point Emily told Julia not to cry, I wondered if the shot was coming next. The only problem in the play was that Julia wanted to help herself to the doctor kit and Emily wasn’t in a sharing mood. We temporarily solved the problem by giving Julia a phone so that she could call the doctor to entertain her hands. I guess Emily has been to the doctor a few times.